CONCERNS about the local provision of ‘high-quality’ business education have been raised. David Oxburgh, chairman of the Guernsey International Business Association, left, and Education, Sport & Culture president Matt Fallaize. 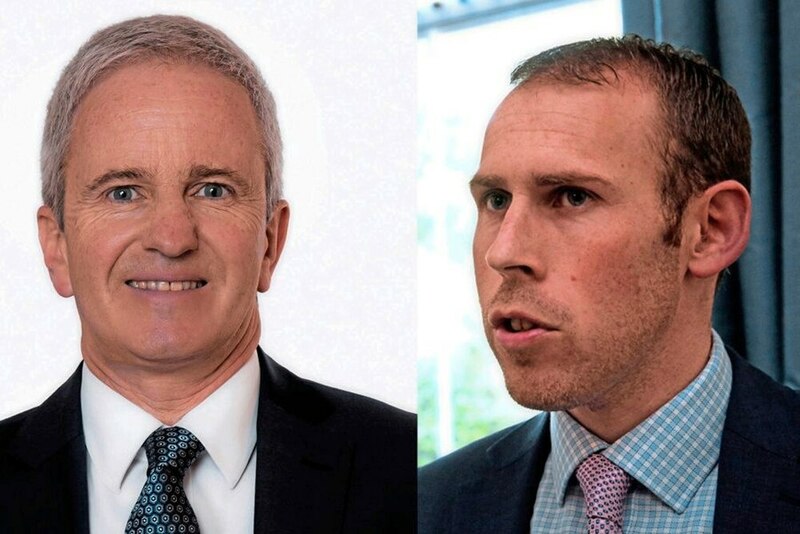 David Oxburgh, who chairs the body representing the island’s finance sector, also directly raised worries about the future of the GTA University Centre – which provides a range of business courses – with Education, Sport & Culture president Matt Fallaize. The exchange came during an event organised by the local branch of the Institute of Directors at which Deputy Fallaize was the guest speaker and he outlined his committee’s plans to overhaul the education system. ‘Broadly the GTA is a success. So many of us here are wearing a business hat and I’m interested to hear what you’re planning on doing to reassure us that there will continue to be high-quality provision of business education in Guernsey,’ said Mr Oxburgh. The chairman of the Guernsey International Business Association also stressed the issue was as important as the wider education reforms, while recognising that efficiency savings could be made. Deputy Fallaize insisted the GTA would not be ‘smashed together’ with the Institute for Health and Social Care and the College of Further Education. Neither would there be a ‘takeover’ of the GTA. ‘We do recognise that each of these three organisations have different clients and their clients have different needs,’ said Deputy Fallaize. There were two models for the GTA’s future – either inside the education department, which would have to ‘lead to closer partnership between all of the providers in the post-compulsory space or revert back to the original funding model and have a business school effectively funded by business’. It was unclear if there was ‘appetite’ in the business community to do that, said Deputy Fallaize. With a ‘lot of cross-over’ between them, an integration working party involving all three organisations has now been set up, chaired by former GTA chief executive Richard Conder. Working as ‘one whole’ would support an advantageous move to university college status for the island as well as provide efficiency savings, added Deputy Fallaize. He also said that if the integration committee agreed a model that worked for their current and future students, it was likely that his committee would endorse it. Mr Oxburgh said Deputy Fallaize’s comments were ‘encouraging’ while repeating concerns about moving the GTA from the remit of Economic Development to ESC given the ‘huge challenges’ facing the department.